The quilling paper artist world is a small one. Even fewer are the number of people who are sharing their work online. But, there are still definitely those artists who are really well-known in the paper craft circles. And one of those is Ann Martin of All Things Paper. So you can imagine my surprise when Ann Martin herself contacted me to see if I would be willing to write a post about her newest book. Of course, I jumped at the chance! Not only was I thrilled to be asked by someone who’s work I really admire (and who is a fellow Delawarean), but I was really excited to pick up some new skills. 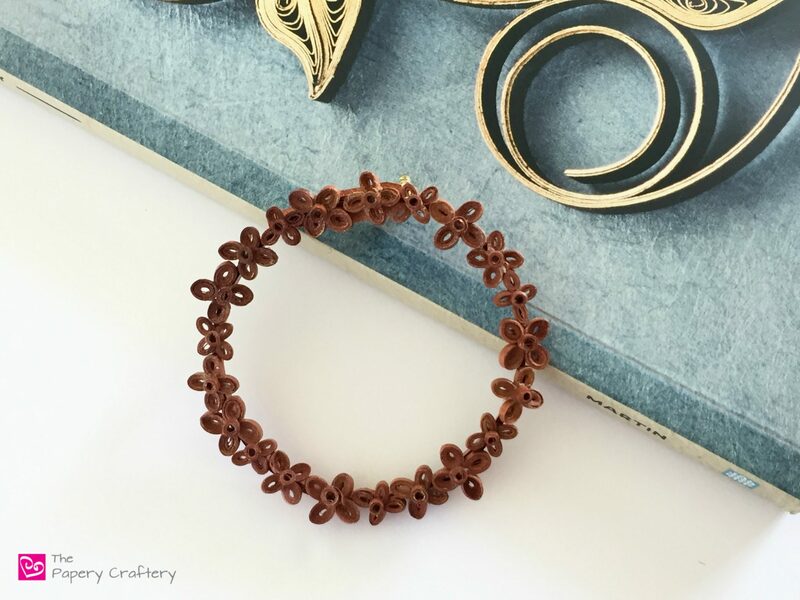 This week, I’m sharing what I created and what I learned in a review of Ann’s new book, The Art of Quilling Paper Jewelry. When I received Ann’s book in the mail, I was immediately impressed and inspired! Not only did she create 20 lovely and unique quilled paper earring and pendant projects, but she also included a thorough explanation of basic quilling technique and supplies! Now, I’m not a quilled jewelry artist at all. In fact, I don’t really wear much besides my wedding and engagement rings and a rubber band around my wrist to pull my hair up. But, something that I really love is a big brooch on my wool winter pea coat. And since Ann’s instructions were so simple and clear, I decided to make a spin on her “Wallflower Wreath Pendant”. I just added a bar pin to make a new brooch for this year. I was able to follow her directions (each project includes both written instructions and illustrations, as well as photographs), only changing the color of the paper to bronze. I’m pretty happy with the way my version turned out. There is definitely not as much luster as in the original. Before I move on to another project, I’ll have to pick up some of the metallic edged strips that Ann recommends in her book. That leaf on page 65 is calling my name! I truly believe quillers of all skill levels will find something to like in The Art of Quilling Paper Jewelry. Plus, if you order now, you’ll have plenty of time to create all sorts of stunning paper earrings and pendants for holiday gifts! Have you picked up Ann Martin’s newest book yet? Which project was your favorite?